This is the fifth of a series of posts on the Christmas story in the gospels. The first one concerned Matthew’s account, the second concerned Mark’s account, and the third and fourth concerned Luke’s account. Then there is John. Unlike Matthew and Luke, there is no Nativity story in John. These both have Nativity stories, even if quite different ones. In John there is a narrative about the coming of Christ: that narrative concerns Jesus’s baptism by John the Baptist. In this respect John’s account is like Mark’s, which also begins with the story of John the Baptist. But John’s account is quite different from Mark’s. He tells the story from a different perspective, and he adds a commentary that is unlike anything in the other gospels. We first hear of Jesus in John 1:15: “John [meaning John the Baptist] bore witness to him, and cried “He who comes after me ranks before me, for he was before me.” That must have been puzzling to those who heard John the Baptist say this. What could this statement possibly mean? John admits “I am not the Christ” and he says he is not Elijah either. So what are you up to, the priests and Levites ask. John tells them of one who is yet to come. In all four gospels John the Baptist tells the crowd that he baptizes with water, but Jesus, the one who is coming soon (or here now) will baptize with the Holy Spirit. But the announcement that Jesus is the Lamb of God, and that He “takes away the sin of the world” is only in John. 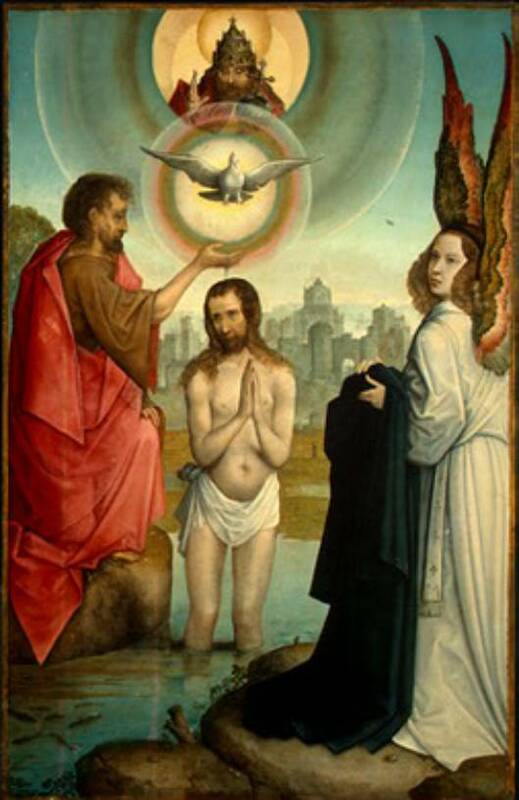 The Gospel of John connects the story of the baptism of Christ directly to the calling of Jesus’s disciples. In Matthew and Mark, the calling of the disciples comes soon after Jesus’s baptism, but only after he has left John behind and gone out into the wilderness. (In Luke, there is no wilderness experience, and the calling of the disciples also comes after Jesus has started his ministry.) In John, John the Baptist himself has disciples. On seeing Jesus again the day after the baptism, John says to two disciples, “Behold the Lamb of God.” Then Andrew (one of the two) goes to his brother, Simon Peter,” and says “We have found the Messiah” (1:41). Then Andrew and Simon Peter, and soon others, become Jesus’s disciples. In these and other ways, John, the gospel writer, testifies that John the Baptist made even stronger assertions about Jesus as the Christ. What we most notice in John, when we read this gospel, is the first 18 verses, which are unlike anything else in the gospels. “In the beginning was the Word, and the Word was with God, and the Word was God. He was in the beginning with God; and all things were made through him, and without him was not anything made that was made. In him was life, and the life was the light of men. The light shines in the darkness, and the darkness has not overcome it” (John 1:1-5). There’s more, of course, another thirteen verses, including this Advent: “And the Word became flesh and dwelt among us, full of grace and truth; we have beheld his glory, glory of the only Son from the Father” (1:14). This is John the gospel writer speaking directly to us, telling us what to make of the coming of the Christ and how to understand it – even though he is telling us that this coming is more than we can ever understand. John wants us to know of this mystery and wonder before he begins telling us the story itself. This is in no other gospel. Now there is something to wonder at on this Christmas Day. I see Matthew, the teacher/historian and Luke, doctor/social worker as having need to start with familial beginning; whereas Mark, the rebel and John, the mystic have not that need, but another to explore. Jesus, the loner-at-prayer, understands those needs, but is most assuredly with the one(s) alone and at prayer this Christmas season. Thanks for sharing of these, Doug. but he brought joy to those who did receive him such as the shephers, and the wise men who still follow Him. I might have stretched some of the above in an attempt to make it fit but it's basicly off the top of my heart and recollection and probably a good jumping off place to do a more in depth discussion for others who are feel led to do so. Thank you for all the time you put into your articles. Jesus said to them, "If you were Abraham's children, you would do what Abraham did, but now you seek to kill me, a man who has told you the truth which I heard from God; this is not what Abraham did. You do what your father did." They said to him, "We were not born of fornication; we have one father, our God." The story as Christians get it drips with hints of a royal destiny; you'd have a hard time finding a traditional Christmas carol that doesn't set that out clearly -- but this is not the 'Jesus the Teacher' beloved of modern liberals so they play those elements down. Nobody likes to think much about the scandalous elements that are also in there: even "the son of Mary" that serves as 'Mark's allusion to Christmas. But these, too, are part of the life God intended Jesus to live... They are not accidental.